12.29.2006 - The Dangers of Grocery Shopping( 0 comments ) I never really thought grocery shopping could be dangerous.. that was until last weekend. I went with bubboteaboy to the Loblaws at Bayview Village to help him pickup a few items for his christmas baking (I still wasn't very mobile with the whole ankle business). For some reason when bubboteaboy and I hang out, we come into some dangerous situations.. not quite as bad as the car one at Demetre's but still scary..
ok, so you're probably thinking it doesn't look like that big of a mess. 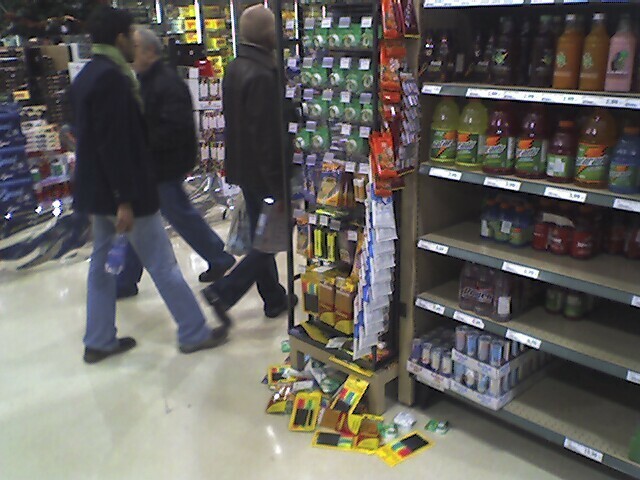 However, this woman literally ran into the shelf head-on, completely emptying the bottom half of the shelf. I didn't give much thought to this incident because really, accidents happen, let's look beyond that. Part 3.. The End ... bubboteaboy and I picked the peanuts we needed.. then proceeded down the aisle saw a shopping cart left there and it seemed someone had accidentally dropped their eggs. We just assumed that they went to get someone to go clean it up.... but we assumed wrong. Upon closer look at the cart, we realized there were about 10 packages of scotch tape in them (see top left of bottom shelf of cart in photo). This was the same shopping cart of the lady who hit the shelf and almost hit me! (see previous photo.. half the shelf was scotch tape). So she abandoned it after another incident. 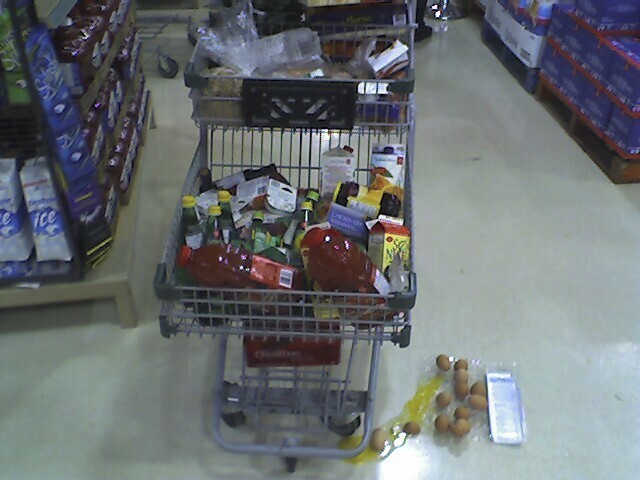 My conclusion is.. she hit something else, the eggs dropped and she abandoned her cart there.... and I reflect back on what I said to her, "you don't want to hit anymore things today". ok, so it's an interesting story.. though seriously, she must've had a really bad day or had a lot on her mind. Christmas can be a pretty stressful time of the year, but one thing I don't understand is why she left her shopping cart.. especially if she needed to buy all those things. I guess I'll never know. Anyways moral of the story - shopping at christmas can be dangerous! 1. Prototype Toyota Electric Car - much better looking than the Prius.. ok, prob because it's a couple. more pics here as well. 3. Chinese Tim Hortons Commercial - never thought I'd see the day.. well only parts of it are in chinese. Seriously though.. chinese parents never like us playing more physical sports like hockey..
5. New Activity for your company's next team meeting? - okay.. our company actually hired these guys for our last team meeting.. it was pretty interesting having everyone act this stuff out.. it was pretty hilarious..
6. Burger King Video Games? - Don't believe it? read here... Burger King is selling video games along with burgers... but they look pretty entertaining, like some of the new Nintendo Wii games. 7. IceHotel! - located in Sweden.. wow.. this place looks pretty good.. and some fabulous pics. Here's the description, "The main restaurant of the famed Ice Hotel chain is, oddly enough, not made of ice. But they do serve meals on plates made from the ice of the Torne River, which borders Sweden and Finland. Elk and reindeer appear frequently on the restaurant’s winter menu. "